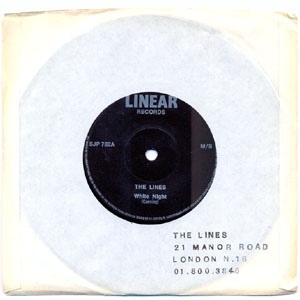 It occurred to me that I should be doing more to promote my band The Lines, soon to release our first “new” album in 33 years…although the material is itself 33 years old, stitched together from archive cassettes. More of that anon. So I decided to start a new thread within this blog, to re-examine all of our releases, in a strictly chronological order. White Night materialized in my brain during the frigid winter of 1976-77. A severe bout of ‘flu had me bedridden and feverish to the point of hallucination. A spiral-shaped riff revolved in my throbbing cranium, with a simple 4-note motif threading through. A somewhat wafting melody, which crucially went up as the riff went down, had me realizing, as I awoke from the fever, that I had something quite good. For a few months me and Jo Forty just played that riff round and round. Sometimes our drummer of the time, Bill Cran, would clatter along. We won some studio time in a competition thrown by Sounds music paper and recorded the first version down in Battersea. It was bad. Then a character named Hywel Phillips moved into the building (in Highbury, North London). Hywel was rather a good guitarist, certainly by our standards. He was one of those Randy California fanatics you come across from time to time, and hell, I like a bit of Spirit myself. He started playing along to White Night and even added a guitar solo, which I was never totally sure about, it being stylistically perhaps a little backward rather than forward looking, but it undeniably worked well within the context of the song. 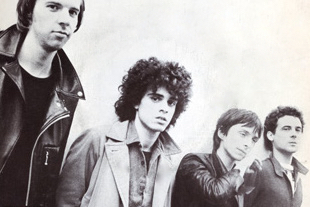 When Pete Harker replaced Bill on drums the song started to sound almost tight. At that point, in the spirit of the times, we decided to pool our money and sling it out ourselves. One day in February 1978 we booked a studio called Clubland out in West London that had a combination deal: 8 hours in the studio and 1,000 seven inch records for 300 quid. And so White Night was born. We hauled that first pressing around every indie record shop in London, and in the process met lots of interesting people. The week it came out Tony Visconti was doing a “celebrity reviewer” gig in the New Musical Express. “The singer is double tracked but he sounds side tracked” he opined, astutely. He complimented the guitar solo and finished by calling it “shunky punk”. Other reviews were less kind. Sounds called it “crib death”, rather coldly. Despite such brickbats, this song has remained fairly popular. It has been covered a few times and also re-released, first in 1979 on Miles Copeland’s Illegal label, and most recently this year on the excellent Cherrystones compilation Critical Mass, from Belfast label Touch Sensitive.